• Special Report: Unique hybrid pitching system of future explored. 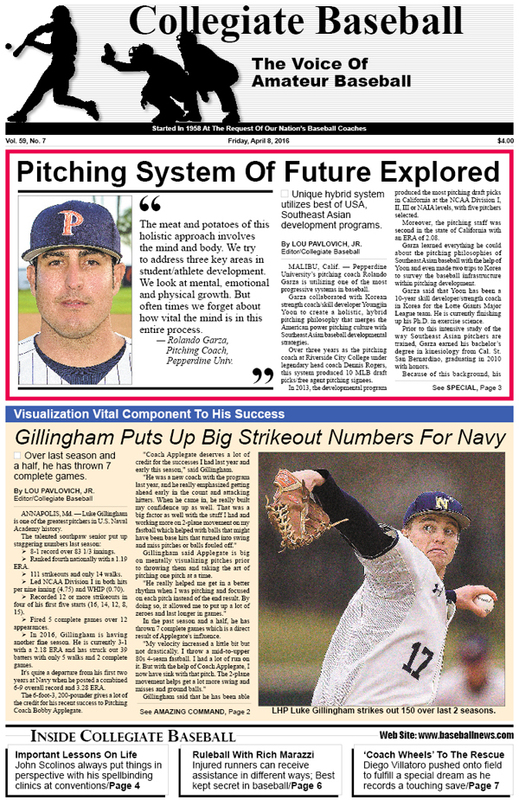 • Remarkable Navy Pitcher: Luke Gillingham puts up huge strikeout numbers with numerous complete games. • Injury Prevention: Assessments are vital tool prior to starting velocity improvement programs for hitting or pitching. • Lessons From John Scolinos: Lesson of 17-inch home plate is one that will never be forgotten by this Hall of Fame skipper. • Ruleball With Rich Marazzi: Few know about special rules that are in place for injured runners. • Special Tribute: Coach “Wheels” puts up save for San Jacinto College despite being confined to wheelchair. • JC Notes: Kent Shelley captures 900th win at Johnson County CC. • HS National Poll: Coppell (Tex) No. 1 at 18-0 in Collegiate Baseball’s National HS Poll. • High School Notes: Legendary Sam Blalock of Rancho Bernardo HS (San Diego, CA) captures 900th career victory. • Collegiate Baseball NCAA Div. 1 Poll: Florida No. 1 after rolling to 23-3 record. • NCAA Div. 1 Notes: East Carolina, Monmouth play wild game that includes triple play, near no-hitter. • National Players Of The Week: Pitcher throws no-hitter for Arizona State while Dallas Baptist hitter belts 6 homers, among other achievements. • NCAA Div. 3 Notes: Salisbury’s Pete Grasso hits three homers with 9 RBI during 34-10 win. • Andy McKay: Consistent, predictable performances can be achieved with ideal emotional state. • NAIA Notes: LSU-Shreveport’s Alex Montero puts together 25-game hitting streak. • Jack Dunn: Fear is one area that coaches should candidly discuss. • NCAA Div. 2 Notes: Missouri Southern’s Jesse Rall goes on tear with 4 homers in 3 games. • Charlie Greene: Solution to injuries is vital. To purchase the April 8, 2016 edition of Collegiate Baseball or subscribe, CLICK HERE.